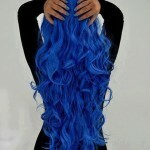 Home » Popular Hairstyles » Cool! Fashionable Boy Cut for Women You May Love! ‘Boy-cuts’ aren’t just for boys and teenage girls, as this chic, short hairstyle shows! This sophisticated short haircut is all about showing off the shape of the head and accentuating the bone-structure of the face. The back and sides are buzzed short with the hair left long on top echoing one of the major trends in men’s hairdressing for 2015. The platinum-blonde shade has slightly darker roots to create extra ‘depth’ and dimension, along with the strong movement and texture in the hair. 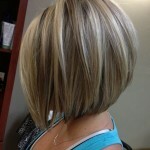 This slightly undercut short style offers an amazing variety of modern styling options. It can be waxed to create a chunky, matte texture and combed forwards to create height at the crown and an uneven fringe down to the eyebrows. It can be worn with curls or waves added to the top, with a deep side-parting or with the fringe fixed with gel into a cute wave framing the forehead, as in the picture! And you can sweep it all back into a very stylish pompadour quiff for any formal occasion, so you won’t get bored with this chic short haircut!